GPS Users: Do not enter Chatfield State Park into your GPS as those directions will take you to the Park’s office. To reach the Launch Site, enter Chatfield State Park at the DEER CREEK ENTRANCE which is located on South Wadsworth Blvd. (Highway 121). Please click the above box for the exact location. The future of propellers is here, today! 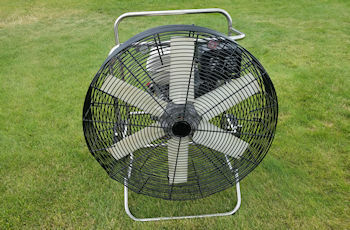 Rocky Mountain Hot Air, LLC has been a distributor of the Multi-Wing Fan since 1994. These fans are designed for higher efficienty and quieter operation. They move up to 30% more air than other fans and feature 24" to 30" polyurethane and fiberglass inlay, multi-wing, adjustable pitch, inflation propellers. All at a price everyone can afford. 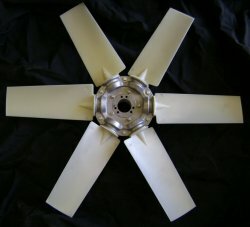 Retrofits are available for nearly every fan on the market. For more information, or a custom quote, please contact us. We no longer make the 3 blade on a 9 blade hub (3 on 9), but we do make a 3 on 6, and a 6 on 6 (shown at right). These propellers work best on eight horsepower engines, or larger.